In this chapter, we summarized the effects of the various anisotropic material properties on light diffraction, space-charge field formation, and photorefractive two-wave mixing interactions. These properties include the birefringence, the dielectric constants, the dichroism, the electro-optic constants, the elastic and photoelastic constants, the piezoelectric constants, the mobility tensor, and the cross-sections for free carrier photoexcitation. All these material properties have a substantial influence on the observable quantities. 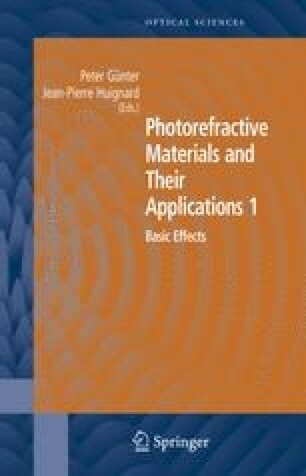 In particular, the role played in photorefractive materials by an anisotropy of the photoexcitation process with respect to light polarization, often over-looked, was discussed in detail here. Also, light diffraction in anisotropic media was treated in deeper detail. While the coupled wave model presented in Section 4.3 does apply to photorefractive volume gratings, it is equally important for any holographic materials having strong birefringence and/or containing volume gratings with strongly anisotropic properties.